We recognise that each investor has individual objectives. 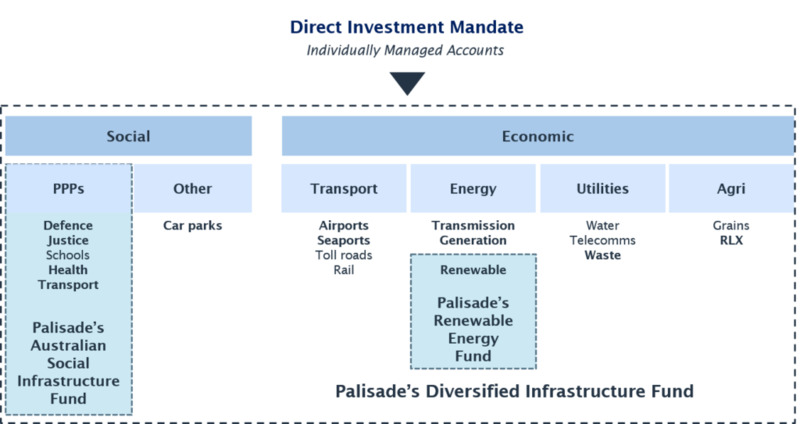 Palisade provides flexible access to unlisted infrastructure investments through pooled funds and tailored portfolios (individually managed accounts). A tailored approach to individual risk and return objectives, with asset selection to an agreed strategy. Investors can access individual strategies and also co-invest with Palisade’s managed funds in target sectors. Core exposure to Australian infrastructure, diversified by sector, geography and asset maturity. Social infrastructure (PPP) assets with predominantly federal or state government availability payment revenue streams. Australian-based renewable energy assets (with ability to take some New Zealand exposure) – with a key focus on wind and solar projects. For further information on any of our Funds, including a copy of our Information Memorandum please contact us.